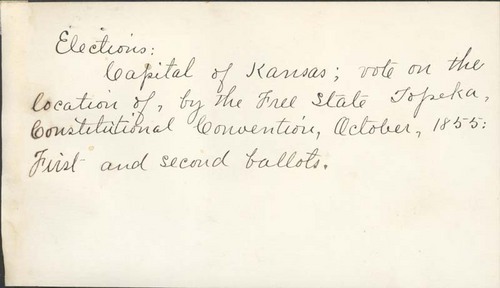 The Free-State government held a constitutional convention in Topeka, Kansas Territory, from October 23 through November 11, 1855. One of its actions was to vote on the location for the capital of Kansas. According to these tally sheets, Topeka defeated Lawrence on the second ballot, 20 to 16. Numerous other towns received votes from the convention delegates on the first ballot. Collections - Manuscript - History - Elections Coll.